The athlete's today did yesterday's workout. We can call this a make up day. I should be there tonite. Since I couldn't make it tonight, Paul gave me a workout to do at home. 4 x 800 meter runs with 3 mins rest in between each. Had to bail on this one. I found areas to do part of the workout but would have to sprint to another area to finsh and had only a ten pound ball to work with. the Squats, Pushups, and Situps. Mike, Perfect. Those minutes go by fast. Awesome job! 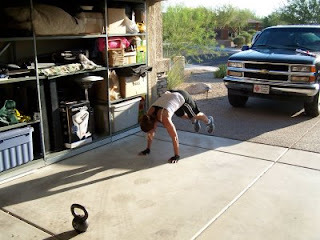 This workout wasn't bad, after all I needed a good sweat burner!! I show up and everyone runs!. Great job Krista!! Way to go Leslie! Wish I made it under 15min! Couldn't be there this afternoon, but repeated the June 24 workout since I didn't have anything that resembled a kettle bell. 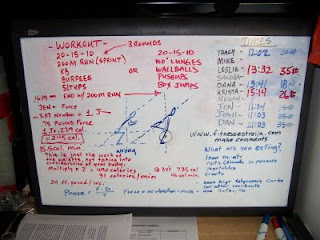 I will make a comment in the June 24 blog so we can compare times when we repeat that workout. I like your thinking Mike L. All these workouts previously are great workouts to do if you can't make it. If you are away just look at past workout days and see if there is one that you may be able to acomadate. Even if you did it recently, that is ok, it is best to try and keep up a routine and get your 2 in 1 off. As Mike said to, make sure you post the times reflecting that workout and just put in the date you did it. Way to go Mike. 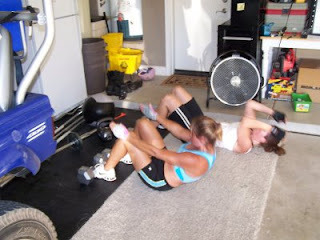 Did Monday July 13, 2009 Workout.